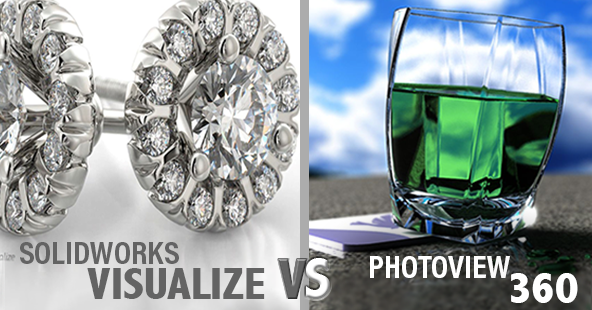 SOLIDWORKS Visualize vs. PhotoView 360: What's The Difference? With their numerous similarities, SOLIDWORKS Visualize, SOLIDWORKS' newest photo rendering software, and PhotoView 360 might seem interchangeable to some. Or maybe you're wondering if PhotoView 360's practical rendering tools are inferior to the best-in-class quality and speed of SOLIDWORKS Visualize. The truth is there are uses for both tools, depending on your applications and design stage. In this post, we'll walk you through the features of each one and compare the two different software. SOLIDWORKS Visualize is a standalone software package designed to take 3D CAD data and transform it into photorealistic images and animations that are ready for print and web in minutes. The intuitive interface allows even non-technical users to develop rich, lifelike visual content with ease. With more robust images, internal team members and external stakeholders can quickly select, validate, improve and market their best and most robust design concepts before committing precious time and resources to a product. 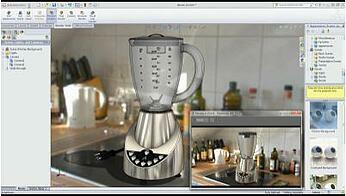 PhotoView 360 enables technical users to create sophisticated, high-quality renderings of their design directly within SOLIDWORKS. It gives users the ability to demonstrate and interact with CAD models in 3D, providing perspectives and angels that would be unavailble in 2D. Users can apply appearances, background scenes, decals and more, right from the 3D CAD model. Let's address the looming question right off the bat: SOLIDWORKS Visualize is not a replacement for PhotoView 360. There are several fundamental differences between the two. 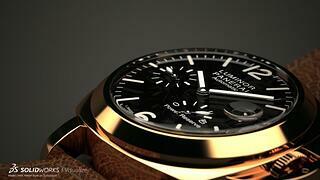 SOLIDWORKS Visualize is appropriate when there are minor or very few anticipated design changes. It's also beneficial in situations when you are close to your product release date and the very best quality is required. Plus, SOLIDWORKS Visualize is a great tool to help market your products early. Imagine being able to promote and gather feedback about your newest product before the first prototype is even buil! When is PhotoView 360 the superior choice? PhotoView 360 is best used when output quality isn't a top priority, such as renderings for internal design verification or communication. If there are many design changes in the pipeline, it's more efficient to use PhotoView 360 as it's built right within SOLIDWORKS. Further, engineers, designers and other technical users are more apt to use PhotoView 360 for everyday design work since they are probably more familiar with its capabilities. Want to compare the two for yourself? Schedule SOLIDWORKS Visualize Training or PhotoView 360 Training in an area near you.